JT IRREGULARS: "How Wisconsin Gov. 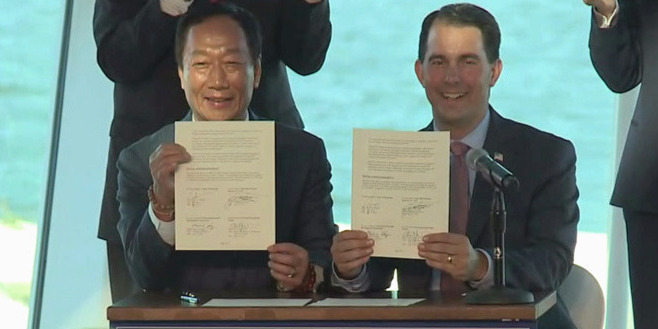 Scott Walker Got Taken in the Foxconn Deal"
"How Wisconsin Gov. Scott Walker Got Taken in the Foxconn Deal"
"Regardless of the final nature of Foxconn’s development in Wisconsin, Gov. Walker’s conceit that an insular manufacturing site will somehow be the viral start of what he is calling 'Foxconn Valley,' a Midwestern Silicon Valley, is the kind of magical thinking which would be comical if it didn’t involve decades of dipping into the wallets of Wisconsin taxpayers"
Gov. Walker’s conceit that an insular manufacturing site will somehow be the viral start of a Midwestern Silicon Valley is magical thinking. And so are his Followers - it's a suicide cult for SE WI.